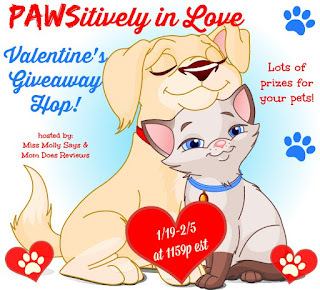 This hop was put together by Miss Molly Says and Mom Does Reviews This Blog Hop is for gift cards or Family-Friendly Gifts for your furry friend. They must be worth at least $15. There is a clickable list after my Rafflecopter to make it easy for you to check out and enter all the others! Miki's Hope will be giving away 1 $25 Petco GC to one lucky winner who is 18 years of age or older and lives in the United States. if you live elsewhere and know that you can actually use this GC then by all means enter! Rafflecopter will be used to pick the winner. I will email that winner who must reply to that email within 48 hours with the email address they want it sent to. Miki's Hope is responsible for getting the prize to the winner. Please note neither Greater Good or Petco is aware that I am doing this. The Petco GC pic is from Amazon where I will be personally purchasing the GC for the winner!! I am NOT an affiliate of any of the sites mentioned!! I love animals--all warm blooded animals at any rate--well maybe not all--but most!! You will sometimes see me blog about my cat, who was a rescue from a rescue organization and she is a terror and a sweet heart all at the same time! I LOVE her to pieces. It has been a while since I wrote about a charity without the charity knowing about it--but get ready--here it comes--And even if you are dead broke you CAN help out here without spending a dime. And I encourage you to do so daily or as often as you can. GreaterGood began in 1999 to provide support for worthy causes through easy, online actions. Since its launch, GreaterGood has contributed more than $30 million to charities around the world. Here are all their Click to Share sites and all you have to do is click in--click on the button on the top of the site and you have helped a worthy cause. Of course all the individual sites have a place to shop or donate to help a specific cause. I have purchased several items at the Animal Rescue site and loved each and everything I purchased. I AM NOT AN AFFILIATE OF GREATERGOOD.COM OR ANY OF THE CLICK TO GIVE SITES, PETCO OR AMAZON. All opinions expressed are my own honest opinions. For more information please check my Disclosure Statement. Our giveaways are in no way sponsored or promoted by Facebook. I've never seen this click to give sites. But I did end up clicking all of them, although some didn't have another button to click to "give". This is great! And an awesome giveaway- we shop at Petco for my furbaby. I've been clicking on that link to donate food every day for about five years. I get a daily email from them that takes me right to the site. What a great giveaway!! I know the cost of pets can add up fast so this is a great prize! I have never known about click to share sites until now. Thank you for letting me know. It is so fulfilling to be able to reach out and help others in need, even in our own little way. I enjoy clicking that button. Every little bit helps a rescue or homeless pet in need! I have clicked the buttons many times on both the Rescue Site and the Rain forest site. I don't currently have them on my blog, but will try and apply them. I always feel so good knowing I helped! I hadn't even heard of the click to give buttons before! I did clink the one in your link and I will continue to do so! What a wonderful person you are! Pets are family and a part of our heart; I agree. We have a rescue dog, and she is a sweetie! I have clicked on the Animal Rights one before but hadn't realized all the others. What a great idea! I never even knew about Greater Good sites, but I will definitely click on them now. Thanks. Each Christmas my mom buys me a sweatshirt or a t-shirt from The Animal Rescue Site. I love their products!And, yes, I've clicked on their sites. Thanks!! This is the first time I heard of this click to give campaign. I'll be clicking this everyday from now on. I have never come across a site like this where you click to give something free!! I hadn't heard of Greater Good before. It sounds like they support a number of really good causes. I used to click the "free food for pets" link but I don't remember if it was this one. It was years ago. I clicked yours! I have not clicked on the Great Good but I will start doing it. I didn't know about clicking on the link. It was my first time. I clicked the "free food for pets"! I didn't know about this! Great idea! I click to donate dog food, cat food and cat litter every day. I get an email and I answer trivia questions to donate. Even if you get the wrong answer they still donate the kibble. I click to give free food daily. Today is the first time I've used any Clickable Links! I hadn't heard of it before, but have signed up to get daily reminders :) I think this is really awesome!! The Greater Good and Animal Rescue sites are two of my favorites. I click on these pages along with the partner pages, including Veterans and Diabetes. I've also bought items from these sites. I like that each purchase contributes a donation. I love being able to save money on pet supplies. This is for a great cause too. Awesome program. Pet supplies can get really expensive. Greater Good sounds like an amazing charity. I don't have any pets but I would donate to a friend who fosters quite a bit if I won! I've never seen that particular button before. I've clicked on the free rice buttons and things like that before. I didn't click on any other ads, though. What a great giveaway. I will be clicking on the links to help out. How fun! I love the warm-blooded furry friends also. I'm sure my dog could put the gift card to good use. Thank you for this awesome giveaway! I would LOVE to win this gift card :) Also, I have never heard of the Greater Good - I will check them out! I have used the Animal Rescue site before, but I had actually forgotten about it until your post and giveaway. Thanks for the remind. I have never seen these click to give links before and didn't know about the Greater Good. Glad I found this giveaway, I clicked on all the give links and bookmarked some! Thank you for the chance! This is the first click to give site I have done this with. I am very into Animal Rescue and have 4 rescued cats and one dog. I like to help and give where ever I can. I don't have a blog so I don't have any of these. I do click on some of these when I remember to check my email and see my reminders. I do the breast cancer one because it runs in my family. My mom and sister have both had breast cancer and my other sister has the BRCA2 mutated gene so she will have surgery when she is done having children. I don't have it which means my children won't. I also do the animal rescue one. We have no rescues or shelters in our parish so about six years ago I somehow became the dog lady that everyone around here comes to about homeless dogs. I've placed upwards of thirty dogs, have eight of my own that wouldn't have fared well finding a home, help transport when we can afford it and donate money and goods when we can afford it, right now I have seven seven week old puppies that I'm fostering until they go to a rescue in MA, and a girl named Gibsland that was left at a burned down house is at the vet being spayed and getting shots. She's been there about a week. Two fosters fell through but I found her a rescue to go to in WI. Now I need to find the money to pay for her vet bill and find transportation to her new life. I should click several more buttons daily (all really) as there are a few other things that affect our family and friends. I have clicked on the Greater Good sites before. I have never done a click to give site until today. I clicked on a few of your links. Thanks for making us aware of this awesome opportunity and thanks for the giveaway! That's the first time I've ever heard of them. I do the thing at sonic that supports literacy in schools though. Oh this is a new one for me too, but I love the charity. Our pup is like family, and I know there are lots of pets who need help. I click all the Greater Good links. It's so easy and takes a second! I found the greater good sites a few years ago and periodically clicked them but am a little skeptical of the impact my clicks have. I have never done a click to give site until today. I think its a great way to donate. I've missed a few days here and there, but basically I click all the causes every day - and have for nearly five years. I also click daily at care2.com and several other sites. What a great way to donate without spending money - when I first get on my computer every day, I do my daily clicks before almost anything else. I click to give on the Autism Site every single day. I have two grandsons with Autism and know first-hand how much therapy means to families. Yes I have clicked on great good to help feed animals before today and I also buy clothing from the site so the proceeds go to them. I bought the Sunshine Daydream Hooded Jacket in the rust color and love it. Now that it is on sale I'm thinking of buying another one because I know when this one is worn out I'm going to miss it. I get the email reminders to click for 2 of them. Just a quick click and you have helped. I also get the reminders. I used to have a tweet set uoo to do this and remind people. I click on every single one. When it is as easy to click and give that I can do! Its a greatt thing, and so easy. NO I have never clicked before and actually haven't noticed them before. I'll pay more attention now that I know. I have not clicked on them before, but what an awesome way to help with only a click! I clicked through all of them! Such an awesome way to help! I haven't clicked on those sites before because I didn't know about them. I don't have a blog. Yes, I clicked to give on any of the Greater Good site. I actually don't have a blog, but yes, I did use some of the the clickable links in your post. I've never clicked but will check it out. This is the first I have heard of these kind of sites! I clicked through to donate to animal rescue. This is the first time that I have done the click to give but it is so easy!! I don't think I've clicked anything before. But I did this time! Yes I have clicked them. I will again too! This is the first I've heard about them. Great idea! I had never heard of the Greater Good sites before now, but I did click on the links! First time clicker for Greater Goofs sites. I visit the Animal Rescue Site and click on the purple button every day! No, it's totally new to me! Before your contest I had never even heard of the Greater Good sites. I did click the button daily. Other than that, I didn't click any of the other links. I clicked. I hope that I was able to help the animals out. Thanks for the opportunity. Yes, I have clicked on all of the sites often.